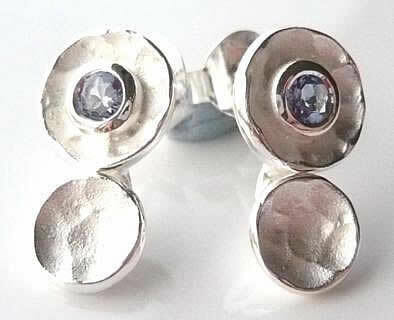 Very unusual silver earrings with a textured satin finish and polished edges and the setting of the 3mm, round, sparkling, tanzanite stones. The studs are 16mm long and 9mm wide and the bottom disc is hinged slightly for extra movement. Very unusual earrings.